This Bullet Logo sunglass strap is made of high quality neoprene and features the Bullet logo boldly printed across the back. Available in Black and Red. This low profile Bullet Logo Beanie Toboggan is perfect for the winter season. Comes in Charcoal gray with light gray logo. 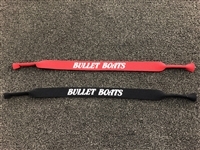 This stylish Bullet Boats Visor is offered in several colors and features a fully embroidered logo with Velcro adjustment. 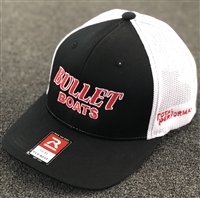 This 100% cotton twill Bullet Logo hat features an adjustable Velcro back in classic white with your choice of Bullet Logo color. These non-structured classic Bullet logo hats feature a full mesh back with adjustable snap band. These are the perfect hat for those hot summer days. This fully adjustable cotton twill hat features the famous Bullet logo embroidered on the front and is available in several colors. Please chose colors below. 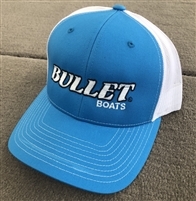 This headwear will keep the sun off your neck and face in style while fishing in your Bullet boat. 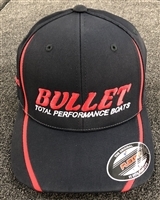 These new style structured front mesh back hats are and awesome edition to your Bullet apparel. There are several color options available. Please choose from colors below. This Bullet logo visor is made from a cool dry style material and looks great. Please choose from the colors below. These new style structured front, mesh back hat is available in Gray Front with Black Mesh and Features Neon Lime Green Logo and Stiching. Available With the Small Logo or the Classic big logo. Choose below. 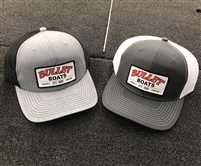 These Bullet Logo hats feature a structured front and are available in Realtree Xtra Green, Mossy Oak New Breakup, Realtree Max 5, Please choose color below. This performance series flat bill hat features all the newest styles of today's generation. Its fitted stretch hat and fits L/XL (7-1/8 to 7-5/8) heads. Its made of Cool Dry material for maximum comfort. Available in Black with Red logo or Black with Silver logo. Pick colors below. This performance series structured curved bill hat features all the newest styles of today's generation. It's a fitted stretch hat and fits L/XL (7-1/8 to 7-5/8) heads. Its made of Cool Dry material for maximum comfort. Pick colors below. This stylish Bullet / Mercury Logo hat features a mesh back. All of these hats, except for the Black and Red, feature a snapback closure. The red has a Velcro closure. Be sure to check out our line of jerseys and shirts that can be combined to match these great hats. This stylish Richardson snapback hat features a solid back and a 3 tone look that screams "Classic Bullet" look. Red, White, and Black with a solid back and snap closure. This trendy Bullet logo hat is a structured hat features a fitted flex fit mesh back in black with a heathered gray front and black logo. This Richardson 112 Trucker Style Bullet logo structured hat features a mesh back in white with a Costa blue front and has a snapback closure. This Richardson 112 mesh back patch hat features our custom designed Bullet patch and is available in Black/Heather gray or Charcoal/White. This stylish hat features a mesh back and a 3 tone look that screams "Classic Bullet" look. Red, White, and Black with a mesh back. 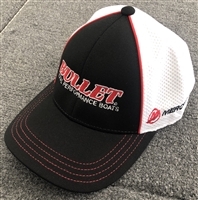 This is a Richardson Flexfit mesh back hat That features "Bullet Boats" on the front and "Total Performance" on the side. This is $25 gift certificate to Bullet Boats. It will be sent to the purchaser as a personal promo code to on the Bullet store website. This is $50 gift certificate to Bullet Boats. It will be sent to the purchaser as a personal promo code to on the Bullet store website. This is $100 gift certificate to Bullet Boats. It will be sent to the purchaser as a personal promo code to on the Bullet store website.